Where I Got It: My wonderful Secret Santa, Kimberly, sent it to me. I am a huge admirer of Jacqueline Kennedy Onassis. I think that she embodied so much of the grace and charm that I always seek to cultivate in my own life. She had a varied set of interests that included art, ballet, reading, fashion, decorating, and even pop culture. All of these are interests of mine as well, which, I think, is why I feel such an affinity towards her. I first saw press on this book back in 2010 before it was originally published. I really wanted a copy because I thought the biography was extremely interesting, but just never bought it. So I was elated when it showed up in my Secret Santa package in December. I started in on it immediately and finished in a few days, underlining, taking notes, and dog-earing pages throughout. Jacqueline Kennedy Onassis was a notoriously private person, who really resented the spotlight's glare on her personal life. She rarely gave interviews. She did not write her memoirs. She even put a ban on her letters and papers being published after her death. But through the projects she was involved with as an editor at Viking, then Doubleday, she left some clues about herself. William Kuhn looks at these clues and tells a story about her based on these books and projects and what others have said about Jackie. During her tenure as an editor, Jackie was involved with upwards of 100 books that speak to her various interests and opinions. 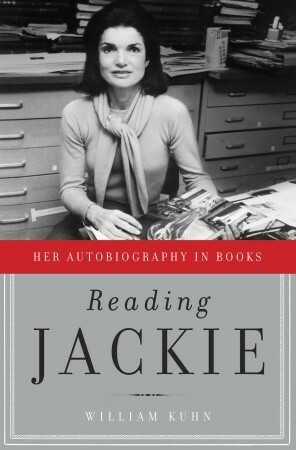 The book opens with a wonderful testament to Jackie's love of reading and books. From there, Kuhn breaks the biography into several topical chapters--such as a chapter about relationships and a chapter about beauty. All the while, Kuhn weaves together a narrative that tells the story of the book's publication process and what it meant to Jackie--the chapter on relationships includes a book about Sally Hemings (Thomas Jefferson's mistress) and the chapter about beauty includes a book with pictures of Marilyn Monroe. I thoroughly enjoyed reading this book. I learned a lot about Jackie Kennedy while reading it. I added a long list of books, authors, and topics to investigate to my already long list. Though maybe some of the connections that the author draws are specious (there's not a whole lot of definitive evidence that she chose to support this book or that book because of a personal connection, in my opinion) there are a lot of coincidences that I think lead the reader to accept these claims as plausible. It is a book that I will definitely look at again in the future, having quickly become a person favorite. Another thing that this book did for me was it reignited an old dream of working in publishing, especially as a book editor, so it's given me a career path that I want to work towards. I would highly recommend this book to people who are interested in Jackie Kennedy or to people who are interested in the concept of how books tell the story of a person. It's also just a great bookish read. LORI. I am related to her on the Bouvier side! Looks like a good read! Thanks for such a kind and thoughtful review of my book. I'm glad you liked it. Let me address your worthwhile criticism. Jackie was not like other editors. She was a celebrity and she was hired both by Viking and by Doubleday for some of the splash and publicity that would give their two different publishing houses. Inside publishing, although she did many things other editors did, there was a lot she didn't have to do. For example, she didn't have to come in five days a week, nor turn up for 3 months during the summer. She was also allowed very wide liberty to do whatever books she wanted to do. The management did prevent her from doing several projects she would have liked to take on because those projects were not thought to promise very much profit. But her selections were deeply rooted in her tastes: she got to work on practically anything she was interested in. The exceptions (like the Michael Jackson book that was kind of forced on her in exchange for her doing some less profitable books she really wanted to do) underline the rule. So I don't think it's too far out of line to say that what she chose to do really does reflect who she was. I think it's totally cool you're interested in publishing as a career. But be careful! It doesn't pay very well, although people at literary agencies seem to make a bit more. And, as you know, publishing is undergoing big changes as a result of the shift to e-readers. So you might want to consider working for Amazon, or Lulu or one of the other online retailers which are leading the digital wave. Anyway, please forgive this long reply. I really am happy you chose to post about Reading Jackie, and I think if she were alive she'd want to encourage your bookishness! I am SO happy you liked this book!! I'm going to add it to my list of tbr.